Nothing beats the durability of solid brass construction when it comes to power and performance in the yard and garden. Blast the boat clean, eliminate debris from the deck, or pressure wash the patio and siding - you'll find dozens of uses around your yard. Turn your conventional garden hose into a high-pressure power washer with the one-piece Sun Joe Solid Brass Sweeper Jet Nozzle attachment. Instantly convert your standard garden hose into a pressure washing powerhouse to produce a concentrated jet stream to tackle a variety of heavy-duty cleaning tasks. Eliminate weeds in the walkway, power wash the wood fence and send dirt flying - the powerful, high-pressure jet sweeper attachment is perfect for removing gunk and grime from hubcaps, power washing the driveway, porch, patio, pool filters and much more. The Little Big Shot<sup></sup> Super Nozzle, made from solid brass, delivers more force with less water, and will not leak. Fully adjustable, from powerful sweeper to fine pin-point stream, it provides superior performance and water efficiency. It may be the most Earth-Friendly nozzle available today! 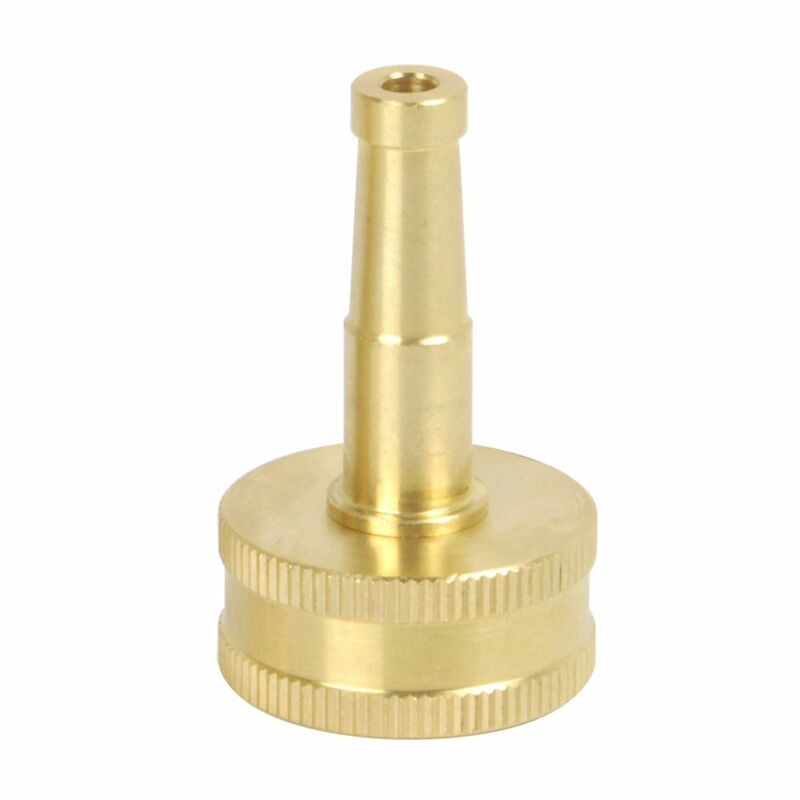 Solid Brass Sweeper Jet Hose Nozzle Nothing beats the durability of solid brass construction when it comes to power and performance in the yard and garden. Blast the boat clean, eliminate debris from the deck, or pressure wash the patio and siding - you'll find dozens of uses around your yard. Turn your conventional garden hose into a high-pressure power washer with the one-piece Sun Joe Solid Brass Sweeper Jet Nozzle attachment. Instantly convert your standard garden hose into a pressure washing powerhouse to produce a concentrated jet stream to tackle a variety of heavy-duty cleaning tasks. Eliminate weeds in the walkway, power wash the wood fence and send dirt flying - the powerful, high-pressure jet sweeper attachment is perfect for removing gunk and grime from hubcaps, power washing the driveway, porch, patio, pool filters and much more. Solid Brass Sweeper Jet Hose Nozzle is rated 4.9 out of 5 by 12. Rated 4 out of 5 by TerdTaco from Worked good for my intended purpose of not having to... Worked good for my intended purpose of not having to buy or rent a power washer to clean my 20' long sidewalk. No shut off so be careful around things/people as it could damage it/them. Rated 5 out of 5 by scard from This little nozzle does an amazing job! It turns... This little nozzle does an amazing job! It turns your hose into a pressure washer. stream It's great for cleaning my pool filter cartridge where really cleans in between the fins so it came out like a brand new filter. It also cleaned the algae growth from between my pavers on the lanai. This is a very durable, high quality gadget. It;s probably good for cleaning those mud dauber nests high up on the house eaves. I can think of a lot uses for this. Note: I added a little brass turn off valve between the nozzle and hose head so I can turn it off and on without having to go back to the spigot. Rated 5 out of 5 by val from This was exactly what I was looking for. This was exactly what I was looking for. Rated 5 out of 5 by Rod from Good quality, The right size for the hose.... Good quality, The right size for the hose. I added a shut off to adjust the water as I used it. Lots of uses around the house.